I’m a very minimal person when it comes to frameworks, I don’t generally like something that needs to generate an entire application file structure like you’d see with Django. When I was searching around for various frameworks to get me started with python and web development, I investigated the usual; DJango, CherryPy, Web.Py. I fell in love with circuits due it’s ease and simplicity, yet it can be quite powerful. This article will show you how to get Nginx setup with uWSGI along with a sample circuits.web application. This article assumes you already have Nginx 0.8.40+ and Python installed. As stated on their wiki, “uWSGI is a fast (pure C), self-healing, developer/sysadmin-friendly application container server.”, it utilizes the uwsgi protocol (notice the all-lowercase spelling), and supports WSGI applications served from it. Once you’ve downloaded the source from the wiki, you can install it (a number of methods here). For my purpose I’ve moved the compiled uwsgi binary to my /usr/local/bin folder so that I could call it from anywhere on my system. Other than FreeBSD I have not seen uWSGI readily available in most distribution’s package systems. Now we’re going to setup a very simple WSGI hello world application, and host it behind uWSGI and use Nginx to serve it. We’re not going to daemonize the uWSGI as such you’ll see it’s output in your terminal as connections are made. Also in Nginx we’ll simply send everything to the backend application for this demonstration. If Nginx is currently running, either restart it, or you can reload the configuration with “nginx -s reload”. allocated 640 bytes (0 KB) for 1 request's buffer. applications dictionary is not defined, trying with the "application" callable. If you attempt to connect to the site, and all goes well you’ll see Hello World on the screen as well as some log outputs on your terminal. To shut down the uWSGI server use Ctrl+C on that screen. Circuits is a Lightweight Event driven Framework for the Python Programming Language, with a strong Component Architecture. It’s also my favorite framework for deploying very simple web applications (but can be used for far more complicated needs, for example SahrisWiki). For this article I’ll show you a few ways circuits.web can really simplify handling requests and URI parsing. First thing we’ll need to do is get the circuits module installed into Python. You can get the egg (2.6 only) or the source of Circuits 1.3.1 from PyPi.Python.org. Ioncube Encoder Pro or Cerberus is required to generate license files that can be distributed to your customers. Most of the nitty-gritty involved with the make_license executable can be found in the user guide (a pdf document) distributed with the encoder in section 4. The entry level version of Ioncube Pro cannot generate licenses, however much of the same restrictions can be applied to an encoded project (section 3 of the user guide) on a per-customer basis, pro/cerberus eliminates the hassle with having to re-encode and redistribute the project for each customer. In this article we’ll talk about two of the most popular restrictions that can be applied to a license. But first we need to look at how to prepare a project to be used with a license. Since I am using Mac OSX there is no graphical user interface, as such these instructions will be based on the command line options. Note there is a passphrase used, you must use a passphrase when specifying a license file to be searched, you will use the same passphrase when generating a license with make_license. With the options above the encoded files will search for a file called key.php, and will check the parent folder recursively until it finds it. If it is a valid license the script will execute normally. If it is not, you’ll get a simple error stating that the code has an invalid license. However I’ve always preferred to show errors a bit more gracefully and more explanatory and to do so the script needs to be able to handle the validation. To do this we add the –license-check option like so. What this does is disables the automatic checking done by the ionCube loader, and allows you to handle the script’s response to an license issue using the Loader API. Below is a simple example how to check if the license is expired and respond accordingly. interpreted as a FALSE response. So there you have it a very brief explanation of how to encode a project to use a license, and how to check for the license yourself so that you may control the output (such as making your own branded page with the error as opposed to a simple text on white background) or alter the project’s features based on the license properties. The ionCube encoder ships with a make_license binary, the Windows and Linux version of the encoder both ship with a linux version of the binary (plus a windows executable for Windows). The Mac OSX version of the encoder only ships with an OSX binary of make_license, which annoyed me quite a bit as I tried to use it on my linux-based hosting provider. For OSX users as of version 6.5 you have to request a linux binary of the make_license file from ionCube support. ./make_license --passphrase yourpassphrasehere --header-line '<?php exit(0); ?>' --property "UserName='Chuck Norris'"
The reason for the header lines is because I like to generate my licenses as php files, such as key.php, this way the license in a public location cannot be viewed via the web since the PHP portion would exist the script before it reached the license data, and its easier than telling your customers to place the license data outside of the public_html folder, especially if you’re not using domain or hardware restrictions on the license file. To add a domain restriction such as example.com (and www.example.com) we would add –allowed-server option like so. The above will make it so that the license is only valid on example.com and www.example.com, wildcards can also be used such as *.domain.com, or for a single character api?.domain.com (where ? can be no more than a single character), you can also use brackets to match a defined set such as .domain.com would match 1.domain.com 2.domain.com and 3.domain.com, likewise [!123].domain.com would match any domain as long as it wasn’t 1., 2. or 3. IP ranges can also be defined (Section 3.6.3 of the user manual for more details). Time-based restrictions can be applied with –expire-in and –expire-on. The first two would expire in 7 days, or 8 hours, the last one would expire on December 21st 2012 (along with the rest of us). This article adds onto the previous entry Paypal IPN with PHP, by showing you how to process an Instant Payment Notification from Paypal with Python. For more information about setting up your PayPal account or purchase code for Instant Payment Notifications, refer to the link above. For any python app, you will need a way to launch it from the terminal. You can use the “shebang” below to make the app self serving. You will of course need to make sure it has executable privilages (chmod +x ./app.py on most unix/linux systems). If the instance of python you are using is not the systemwide instance such as python 2.6 installed to /opt, you will then then change it to use python2.6 instead. You still launch the app via the interpreter directly, omitting the above shebang if you’d like. With the exception of circuits.web, all of the modules used are built into Python (as of 2.6 to my knowledge). I have created a separate method for verification to keep the rest of the code cleaner. This is pretty much the same process PayPal provides developers, plus two checks that I feel are important. The verification url provided above is for the PayPal sandbox, a developer testing ground. 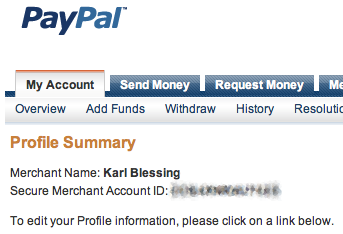 You can signup for access to test accounts, and tools such as IPN Test submissions at PayPal SandBox. When the app is ready for production, simply remove .sandbox from the url. Next is a currency check, because 100 Zimbewe dollars is not equivalent to 100 US Dollars. The variables mc_gross as well as item prices don’t establish the currency used, but rather simply the value amount. So this check is important to protect against incorrect purchase amounts. Now we have the main Root class of the IPN app. # or setup accounts upon successful payment. The status will always be "Completed" on success. # Likewise you can revoke user access, if status is "Canceled", or another payment error. class Root(Controller): # if the app will not be served at the root of the domain, uncomment the next line #channel = "/ipn" # index is invoked on the root path, or the designated channel URI def index(self, **data): # If there is no txn_id in the received arguments don't proceed if not "txn_id" in data: return "No Parameters" # Verify the data received with Paypal if not verify_ipn(data): return "Unable to Verify" # Suggested Check : check the item IDs and Prices to make sure they match with records # If verified, store desired information about the transaction reference = data["txn_id"] amount = data["mc_gross"] email = data["payer_email"] name = data["first_name"] + " " + data["last_name"] status = data["payment_status"] # Open a connection to a local SQLite database (use MySQLdb for MySQL, psycopg or PyGreSQL for PostgreSQL) conn = connect('db') curs = conn.cursor() try: curs.execute("""INSERT INTO ipn (id, purchased, txn, name, email, price, notes, status) VALUES (NULL, ?, ?, ?, ?, ?, NULL, ? )""", (time(), reference, name, email, amount, status,)) conn.commit() except sqerr, e: return "SQL Error: " + e.args conn.close() # Alternatively you can generate license keys, email users login information # or setup accounts upon successful payment. The status will always be "Completed" on success. # Likewise you can revoke user access, if status is "Canceled", or another payment error. return "Success"
In most cases you would host each application on their own domain or subdomain, such as ipn.domain.com. But I generally prefer to run all my apps from a single subdomain, such as apps.domain.com. The Controller above is expecting / for the root base, not /ipn/ like I would have. As a result we add the channel line to inform the controller of the new base. The variable data will be received as a dict type, we’ll first check to make sure data has come in (by seeing if there’s a transaction ID with the data received), then verify the data with Paypal. Once verified, the desired information can be stored in a database, be it SQLite, MySQL, PostgreSQL or Durus. Three things I would suggest for this portion: use a log or email to keep track of errors, and if you use sell a number of products online, check the item ID and prices to verify their accuracy. Also if your products are subscriptions, or prone to returns, check to see if a transaction ID already exists in the database and update it’s status accordingly as opposed to creating a new record for every instant payment notification, useful if someone cancels or charges back their transaction. The next method is not very practical by itself but could lead to more useful ideas. This would be placed under the same Root class above. The above method would allow you to access a URL such as http://domain.com/lookup/transactionid/ or http://domain.com/lookup/?id=transactionid, and in return see the name of the buyer of that transaction. We still need a way to serve this app to the web so that Paypal can reach it. As of writing this, Unix Sockets are only supported by the development build of Circuits.web, which can be accessed with mercurial using https://dev.circuits.googlecode.com/hg/. The current 1.2 stable release can be obtained from Circuits – Google Code, or by supplying easy_install with the package ‘circuits’. An alternate web framework of similar syntax is CherryPy. Paypal always considers a response code of 200 as confirmation that the notification has been successfully delivered. In your production copy you’ll likely wish to change the output to log the errors, and send back a generic error message to the screen, possibly by creating another method. View the next page to see the example code in uninterrupted form, as well as information on serving the example app with the Nginx webserver. In a previous guide I showed how to use Passenger (aka mod_rails) to work with Python (WSGI) scripts. While this proved effective for simple wsgi applications, a framework such as Django required a bit more love. This guide assume you already have everything installed from the previous guide, and that Python has already been configured with Django and other modules. Aside from having the usual setup, you will need the original Django source files. One way of going about this is downloading the latest source from the Django Project. The next couple of steps assume you have nginx installed at the /usr/local/nginx/ location, and already have a src folder under your home folder. I should note, my /html/ folder isn’t publicly accessible because all my sites are subfolders under that location. I use it primarily to store resources for the folders beneath it. You can change where you save the source, just remember where you put it and that the webserver has access to it. Open up your nginx configuration where you have already setup a passenger app from the previous guide. Should look something like this. Now you have either create or move your django application into the site folder. For example, if your site is defined as /usr/local/nginx/html/project.domain.com like above, and your django application is called mytest , you will end up having it located in /usr/local/nginx/html/project.domain.com/mytest. 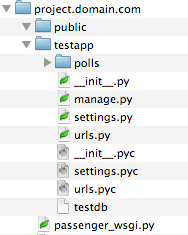 In the end you should have a folder structure similar to this (based off the Django tutorials). After saving, should restart the nginx server, then load up the site in a browser. If this is a new Django application you’ll be greeted with a “Welcome to Django” page, otherwise the application you had already created. Static content can be access by creating additional Aliases in Nginx, or by using django.views.static.serve method in your applications url settings. Update 1/31/2011: There is now an article showing how to deploy Python (namely with Circuits.web) via Nginx + uWSGI. Update 9/29/2010: As of version 0.8.40 Nginx now supports wsgi applications running over the uWSGI protocol natively. Click Here for more details. The 0.8.x branch is now the current stable branch. One possible solution was to run Apache as a backend server listening on 127.0.0.1:8080 (or a port of your choice), which could also be easily used to serve up other dynamic content such as php. Many have used this setup for a great deal of internal load balancing, letting Nginx serve strictly static content, and Apache to handle the dynamic content. With the above method you could go with the easy route of having mod_wsgi (as of this writing, mod_wsgi is available at 2.5 supporting Python 2.6) installed via Apache. However doubling up the number of webservers run, might defeat the purpose of running Nginx for some of us, especially for those less familiar with Apache configuration. There was a port of Apache’s mod_wsgi over to Nginx by Manlio Perillo. However this module had only been tested on Nginx 0.5.34, and patched for 0.6.*. The nginx version of mod_wsgi borrows some code from my original Apache version, but obviously since the internals of Apache and nginx are very different, the main parts of the code which interface with the web server are unique. Although I condoned use of the source code, I do wish I had insisted from the outset that it not be called mod_wsgi due to the confusion that has at times arisen. Although development on the nginx version of mod_wsgi appears to no longer be happening, this isn’t stopping people from using it and many are quite happy with it. The question is whether they really understand anything about how nginx works and the shortcomings in how nginx and mod_wsgi work together. Admittedly the author of the mod_wsgi module for nginx has been up front in pointing out that because nginx is asynchronous, and with WSGI not designed for such a system, that once the WSGI application is entered all other activity by the web server is blocked. The recommendation resulting from this is that static files should not be served from the same web server. Use of multiple nginx worker processes is also suggested as a way of mitigating the problem. There is however a far more practical solution fit for production use, especially for those using modern versions of Nginx.